It is interesting how we develop opinions about things both good and bad. Gazpacho has never been on my list of favorites and the only reason I can think of is 12th grade gourmet cooking class. That was the year that the Home Ec department (OK.. so I was in High School when it was still called Home Ec!) ran a cooking competition. I love a good competition especially one where I think I have a good chance to win. For this entry I created this amazing layered meringue baked to perfection and layered with lime curd and lemon curd and finished off in the middle with a mix of berries and scented cream. It was stunning if I do say so myself. It came in second. Ron won with his Gazpacho! I have had an aversion to Gazpacho ever since. 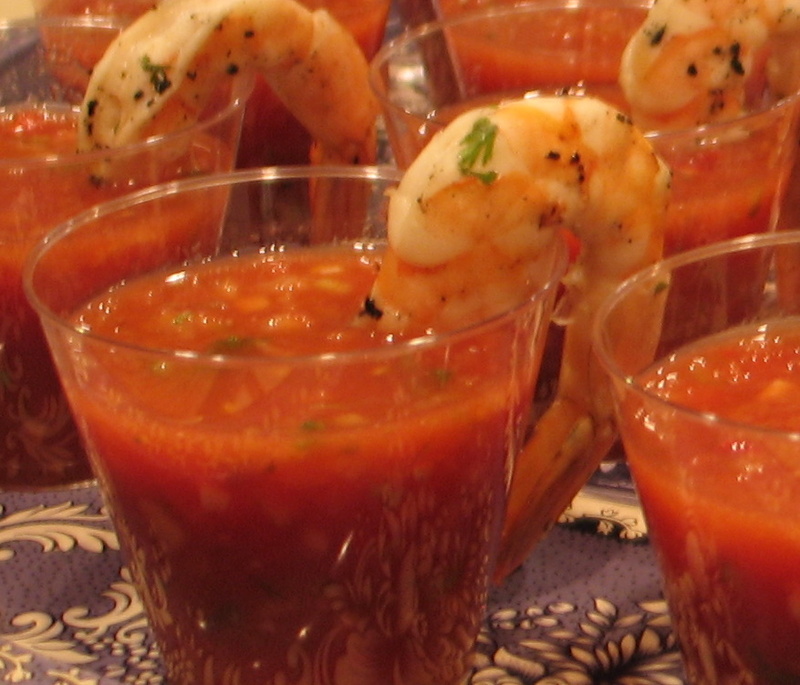 So here, years later I am playing with Gazpacho and… newsflash.. absolutely love it. Cold, crisp and refreshing it is the perfect lunch soup or starter to a great meal. Use the freshest ripest tomatoes you can find, perfect for the plenty of summer just around the corner. I have paired it here with a tail on shrimp soaked in lime and cilantro. If you do not have a stick blender you really need to put that on your birthday wish list. They are amazing. Mine is over 20 years old and I use it for everything from soups to salad dressings. They are inexpensive and just ohh so handy. If you don’t have one you can use a blender or food processor to puree some of the mixture to get it down to the right consistency. Cover and allow to marinate for 1 hour in refrigeration. Stir every 15 min.